This from March 27, 2019, shows the Grindr icon on a phone. This week, the Committee for Investment in the United States reportedly directed Beijing Kunlun Tech to divest itself of Grindr, a gay dating app, because of concern the data it collects could be used for blackmail. But given growing U.S. concern about Chinese companies with ties to Beijing buying businesses in sensitive U.S. industries, the committee's rare intervention to undo the deal was hardly a surprise, said Harry Broadman, a former CFIUS member. "I think anyone who was surprised by the decision really didn't understand the legislative history, legislative landscape and the politics" of CFIUS, said Broadman, who is now a partner and chair of the emerging markets practice at consulting firm Berkley Research Group. While the administration has yet to formulate a policy on Huawei, the world's largest supplier of telecom equipment, the latest CFIUS action underscores how the U.S. is increasingly turning to the body to restrict Chinese investments across a broad swath of U.S. technology companies. "CFIUS is one of the few tools that the government has that can be used on a case-by-case basis to try to untangle [a] web of dependencies and solve potential national security issues, and the government has become increasingly willing to use that tool more aggressively," said Joshua Gruenspecht, an attorney at Wilson Sonsini Goodrich & Rosati in Washington, who represents companies before the committee. CFIUS's history has long been intertwined with politics and periodic public backlash against foreign investment in the U.S. In 2007, outrage over CFIUS's decision to approve the sale of management operations of six key U.S. ports to a Dubai port operator led Congress to pass new legislation, broadening the definition of national security and requiring greater scrutiny by CFIUS of certain types of foreign direct investment, according to the Congressional Research Service. Slated to be fully implemented in 2020, the new law vastly expanded CFIUS's jurisdiction and authority, requiring foreign companies that take even a non-controlling stake in a sensitive U.S. business to get the committee's clearance. "There is no mistake that both the congressional intent and the executive intent have a clear eye on the role of China in the transactions," Broadman said. 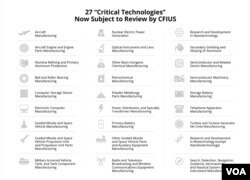 Under interim rules issued by the Treasury Department last fall, investments in U.S. businesses that develop and manufacture "critical technologies" in one or more of 27 designated industries are now subject to review by CFIUS. Most of the covered technologies are already subject to U.S. export controls. The designated industries are sectors where foreign investment "threatens to undermine U.S. technological superiority that is critical to U.S. national security," according to the Treasury Department. They range from semiconductor machinery to aircraft manufacturing. The new regulations mean that foreign companies seeking to invest in any of these technologies and industries must notify CFIUS at least 45 days prior to closing a deal. CFIUS will then have 30 days to clear the deal, propose a conditional approval or reject it outright. If parties to a transaction do not withdraw in response to CFIUS's concerns, the president will be given 15 days to block it. The number is deceptively small. A far greater number of deals are simply withdrawn by parties after they don't get timely clearance or CFIUS opens a formal investigation. According to the Treasury Department, of the 942 notices of transactions filed with CFIUS between 2009 and 2016, 107 were withdrawn during the review or after an investigation. "I think the short answer is it's too early to tell," Gruenspecht said. However, he added, if the new law "becomes a recipe for taking foreign investment off the table for whole realms of new emerging technology, that crosses a lot of boundaries."